Here at Cruz Life Center, we specialize in laser therapy. We are proud to serve patients in Burnsville, NC and the surrounding communities. Laser therapy is a treatment that utilizes specific wavelengths of light to interact with tissue and help accelerate your healing process. 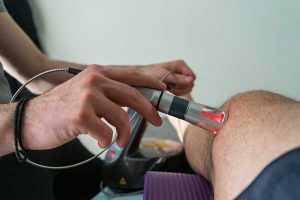 Laser treatment can be used on people suffering from acute and chronic conditions in order to eliminate pain and swelling, increase functionality, and reduce spasms. Our friendly and educated chiropractor will hold the laser and place it directly on the injured area for a few minutes. At this time, the non-thermal photons of lights will be emitted from the laser and pass through the skin layers. The light has the ability to penetrate two to five centimeters below the skin at 90 mw and 830 nm. If you have any questions regarding laser therapy, contact us today at (828) 682-6157.